“Be always joyful, and even . . . noisy!” said Pope Francis to two Religious Communities, present at the General Audience held in the Vatican’s Paul VI Hall, on Wednesday, August 9, 2017. “I wish to address a word of welcome to the Religious Sisters of Mary Immaculate-Claretian Missionaries, gathered in their General Chapter, as well as to the Sisters of Charity of Saint Joan Antide, who are preparing to celebrate their perpetual vows,” said the Pontiff in Italian, unleashing joyful cries in their ranks. “Dear sisters, be always joyful, and even noisy!” At this point, applause broke out everywhere, with bursts of laughter throughout the audience hall. 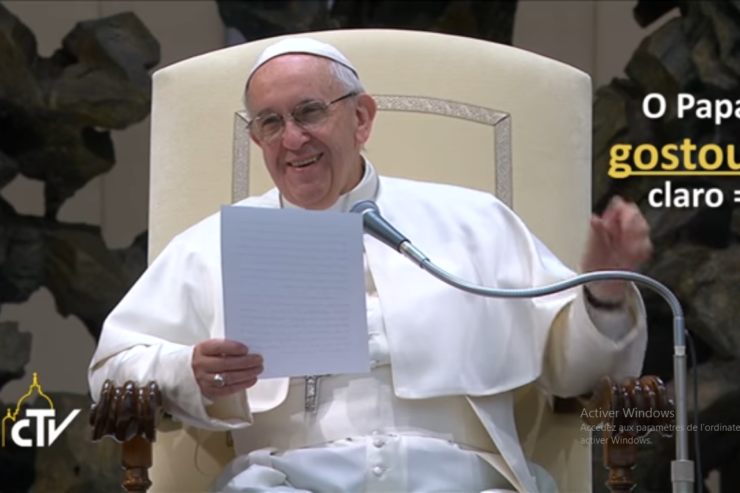 “And witness everywhere the beauty of your consecration to God and to the Gospel,” encouraged the Pope. Earlier the Holy Father had dedicated his catechesis to divine forgiveness as the “engine” of hope and he made an appeal for peace in Nigeria and in Central Africa. Then he greeted young people, the sick and newlyweds, before praying the Our Father and imparting the final Blessing.